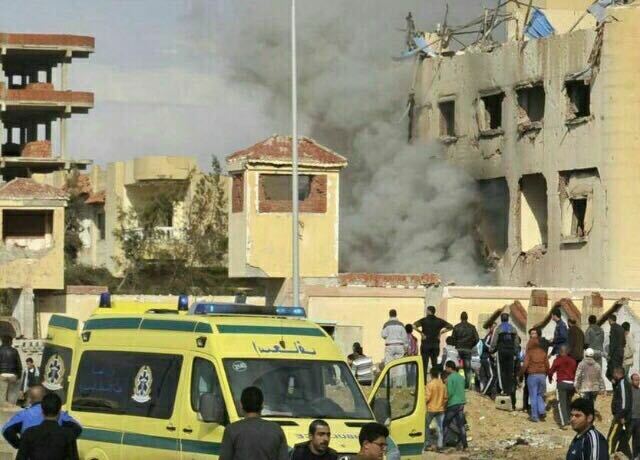 Mustafa AY – TDO – 25.11.2017 On Friday, Egypt’s Sinai was shocked with the consecutive attacks that Friday prayers at Al Rawdah mosque, which is located to the west of the city of Arish in the northern Sinai Peninsula, were under heavy gunfire once bomb was set off by villain terrorists. According to official figures, 235 people have been murdered due to such an inhumane attack. Besides the hundreds of deaths, 130 seriously wounded victims were transported to hospitals. However, the ambulances referred to the Al Rawdah mosque were also under heavy gunfire by the terrorists, while they were striving for transporting the wounded’s to hospital. Stampede of the Friday prayers occurred because of the severity of attack. They all tried to flee neighborhood in which the consecutive bloody attacks happened. After so-called Islamist terrorists ended the attack, they tried to escape from the area. However, Egyptian Armed Force’s armed-drones eliminated 15 of them on the desert. Egyptian Security Forces released a statement with the aim of calming society. According to the statement, Egyptian armed forces in Sinai was mobilized to search for the terrorists. Besides these explanations, Egyptian officials made a statement that they suspended to open Gaza crossing till Saturday because of security measures. These attacks resulted from an ongoing Sinai insurgency which have been lasting between so-called ‘Islamist’ terrorists and Egyptian Security Forces and have costed many innocent civilians’ lives as well as Egyptian official’s lives.